They modified Masquerade's puzzle by translating the phrases surrounding each painting into Italian, and then substituting their own numbers in Williams' two magic squares. Decoding the squares correctly allowed readers to count the letters round each painting and find the phrases “Monterosso al Mare” and “Statua del Gigante”. They also inserted two consecutive sentences in their translated text of Masquerade's story, the first one ending “.alle calcagna”, and the second beginning “Del Gigante oceano...”. Dropping the full stop between these gave the phrase “alle calcagna del gigante,” or “at the heels of the giant”. This Italian cousin for Masquerade was published in March 1981, and remained unsolved until May 6 the following year. The finder was 41-year-old Carla Vignola, who climbed the cliff for herself when the heel clue finally struck her a year after buying the book. Denon and Arnold were watching her from a hiding place nearby, and showed themselves only when Vignola had successfully excavated her prize. I would have been 21 when Masquerade first came out and I do remember seeing a copy of the book at around that time. I puzzled over it briefly, decided I didn't have a clue where to begin solving it, and then went back to guzzling cheap lager and jumping around at Clash gigs. Like everyone else, I saw the news coverage of the hare's discovery in March 1982, and concluded from the information that followed that I would never had had the patience or imagination to get remotely close to finding the book's solution. Masquerade was an anagram of ‘made square’, wasn't it? What more proof could anyone need? I never forgot Masquerade, though, and it came bubbling back to the surface of my mind when I stumbled across a copy of Gascoigne's Quest for the Golden Hare in a second-hand bookshop in 2004. That prompted me to investigate Dan Amrich's excellent Masquerade website, and a month or two later I was up to speed on the whole remarkable story. I managed to sell The Idler a 3,000-word article about Masquerade for its Spring 2005 issue, and was left hoping I might one day get the chance to tell the story at greater length. That chance came in 2008, when I realised the 30th anniversary of Masquerade's publication was coming up, and took that opportunity to pitch a Radio 4 documentary about the book to an independent production company I sometimes worked with. That company - Whistledown Productions - included the idea with their proposals for the next commissioning round and, a few weeks later, Radio 4 agreed to buy it. My job was to research the basic story, conduct a handful of location interviews and contribute to the jointly-written script. Our presenter, the author and broadcaster John O'Farrell, handled the studio interviews, while Whistledown producer Emily Williams managed the whole process and edited the hugely disparate material we'd gathered into a coherent whole. In the course of doing all this, we interviewed quite a few of Masquerade's keenest followers - Mike Barker, John Rousseau, Neil Parrack, Karen Stephens - and that's where most of the quotes that follow were obtained. Williams' first notion of just how obsessive some British Masqueraders would get came in the competition's very early days, when he received a letter from a reader who'd travelled all the way from Switzerland to Cornwall in pursuit of the hare and then got himself stuck half way up a cliff there when the tide came in. None of our interviewees could quite match that degree of lunacy, but it certainly wasn't for want of trying. Take Cheltenham actuary Neil Parrack and his family. Neil, his wife Ann and a couple of their older children were studying Masquerade round the kitchen table in the small hours of December 27, 1980. 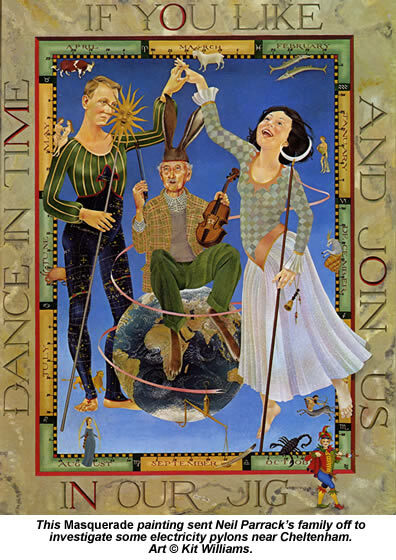 They settled on Williams' second painting, which shows a pair of dancers representing the Sun and the Moon, flanking a merry old gent who's sitting on top of the Earth. The moon-man's trousers are patterned with a star map, on which the words “Taurus” and “Orion” are visible. Around the edge of the picture appear all 12 signs of the zodiac, each with its appropriate symbol. The family dug out an Ordinance Survey map of their own county, and found the nearby Needlehole Farm. And what's the hole in a needle called? The eye! The Parracks went off to bed in triumph, convinced they had only to drive the few miles out there to claim their prize. Charles, Neil's 17-year-old son, was so excited that he rose at 6:00am, borrowed the family car, and headed off to Needlehole while his parents slept. Alas, the waterlogged country lanes around there prevented him finding the farm, and he returned home with nothing to show for his efforts but some very muddy clothes. Neil took a more deliberate line. He recruited his friend Tony Bennett - a heavyweight puzzler from the Government's GCHQ intelligence centre - who quickly concocted some dubious numerology to count out the word “Gemini” from the painting's border letters. The final confirmation came when Bennett pointed out a pylon marked on Needlehole Farm's land, indicated by the Ordinance Survey's standard symbol of a letter “X” inside a square. Any schoolboy knew that “X” always marked the spot where buried treasure was to be found, and as for the square, well, Masquerade was an anagram of “Made Square,” wasn't it? What more proof could anyone need? The expedition returned home defeated, its two leaders enduring superior smirks from their far more sceptical wives. Neil wrote to Williams with an account of their adventure, who was tickled enough by this to recommend the families to a US television crew looking for Masquerade eccentrics. The two families joined forces again to re-enact their Needlehole visit for the cameras, and were duly splashed all over American TV. Still they weren't quite ready to give up. A second bout of numerology produced the phrase “code hare at large”, but that didn't seem to be much help either. Like the many hunters who obsessively anagrammed every element of Masquerade, the Parrack/Bennett team had proved only that, given enough data and a free hand how to manipulate it, you could produce any answer you chose. As they would discover when the hare was finally unearthed, though, they had been right to start by thinking about eyes. By the time he'd finished, Argent had about 20 pieces of music - most of them full songs. He showed me the old reel-to-reel tape boxes containing his original demos. The hand-written notes scrawled on the box lids listed each tape's contents: I'm in the Dark, The Awakening, Love Let Me Be Your Slave, Looking for a Friend, Devotion, My Lord the Sun, Making of the Jewel, Masquerade, Choose a Number, Which One is Me and Towards the Morning.